The NU Drama Department, directed by Professor Chrystal Helmcke, is performing “The Women of Lockerbie” this spring. Opening night is on Friday, April 5, and showings will continue on April 6, 12 and 13 at 7:30 p.m.
“The Women of Lockerbie,” written by Deborah Brevoort, is based on the 1988 terrorist attack in which a bomb detonated aboard Pan-American Flight 103 on its journey from London to New York City. The plane crash in Lockerbie, Scotland, took the lives of 243 passengers, 16 crew members, and 11 locals. This 2003 poetic drama follows a mother from New Jersey as she searches Lockerbie for her son’s remains, which were lost in the plane crash. There she encounters the women of Lockerbie, who are fighting to obtain clothing from the wreckage in order to wash it and return it to the victims’ families. These women share with the mother their desire to triumph over evil through an act of love. 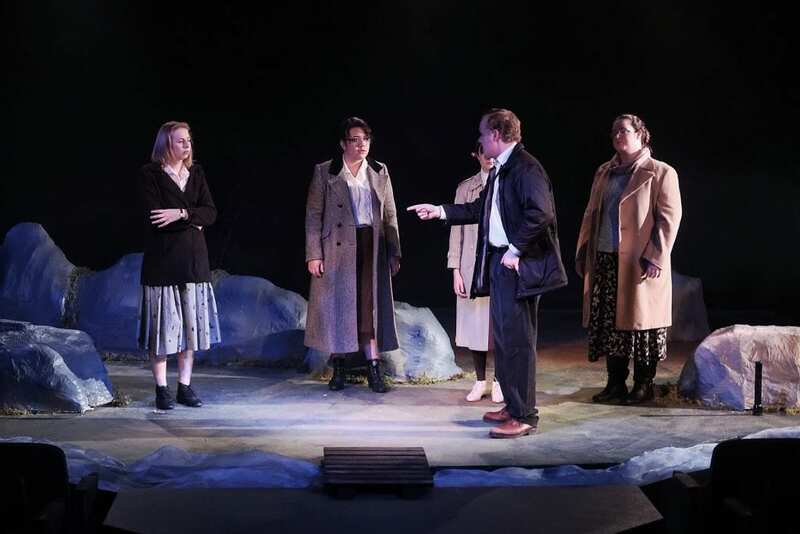 The performance of “The Women of Lockerbie” marks an extreme change in tone from plays more recently done by the Drama Department. For instance, this past fall semester had a successful performance of “Fools” and before that was the chuckle-inducing performance of “Good Luck, Charlie Brown.” The department rotates genres each semester: from Classic American, to elevated language like Shakespeare, to musicals, etc. “The Women of Lockerbie” occupies the position of “alternative space” in the rotation cycle. Helmcke said that she believes that this play chose her, and not the other way around. She said she was reassured in her choice by a series of “Holy Spirit moments,” including the timeliness of the 30th anniversary of the crash — which was only three months ago — and the resurgence of the event’s significance throughout the team’s rehearsals. Having a tragic and serious tone, “The Women of Lockerbie” takes on some difficult topics, including hatred, sorrow, and pain. The themes of the play spark challenge to the audience as they rediscover an understanding of the topics, especially from a Christian perspective. The team asks the audience to prepare for real content. Nothing is sugar-coated about “The Women of Lockerbie,” but that is what makes it such a powerful performance. There is some language that viewers should be prepared for, as an extension of the characters’ raw emotions. This entire performance is about bringing the event and the accompanying emotions onto the stage for all to experience. Interestingly enough, many of the lines in the play are taken directly from interviews with either the Scottish people or families of the victims. Each member of the drama team researched the tragedy in different ways to prepare. The play will ask the audience to be vulnerable — to dive deep into issues not necessarily light-hearted. But within that vulnerability comes a greater insight. “We’re inviting the audience to go to the dark place with us, but we won’t leave them there. We promise there’s light at the end,” Helmcke said. Make sure to mark April 5 on your calendars for opening night, so you and your loved ones can experience the light of “The Women of Lockerbie”. Tickets will be sold ahead of time at a discounted rate, as well as at the door. Discounted advance tickets can be purchased here. Shout-out to Nicole for this terrific article and Lynn for the great photo. It means so much to the NU Theatre program to have excellent press coverage!